A quad bike returning to South Rakaia Huts. I estimate that it will take at least one hour to walk from South Rakaia Huts along the length of the lagoon to the river mouth itself. Above a successful angler cleans a salmon at the western end of the Rakaia River Lagoon on 7 February 2012. While behind him the long lagoon stretches lake-like for some 5km into the distance. The river’s outlet to the sea is at the far eastern end opposite the North Rakaia Huts settlement. This means a long trek down the shingle spit for anglers arriving from the south side of the river mouth wanting to fish the gut and surf. Unless your four-wheel-drive truck is very capable over loose stones you will need a quad bike. Otherwise, a long walk will be in order. This photograph was taken from the end of the shingle spit on the western side of the mouth looking over the spit on the eastern side across to North Rakaia Huts. You can just see the lagoon behind the spit. A quad bike is the best way to get there. It looks like the river mouth will be at the North Rakaia Huts end for this year’s 2012 Rakaia Salmon Fishing Contest. 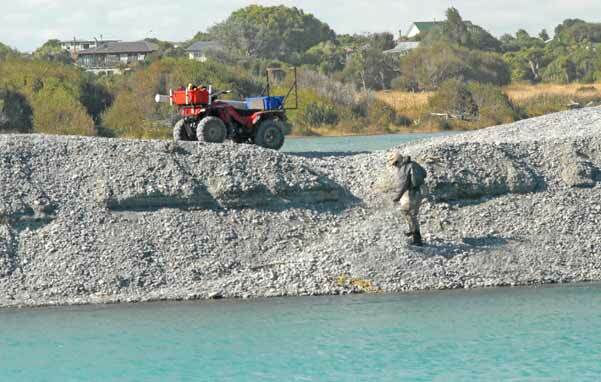 Anglers at the end of the spit on the eastern side of the Rakaia River mouth. Another great means of transport is a jet boat seen here motoring west along the Rakaia Lagoon towards South Rakaia Huts. Salmon entering the river mouth must travel almost the entire length of the lagoon to reach the river proper. This is quite unusual and indicates that there has not been a significant flood for some time. A jet boat makes river travel a breeze! You can still reach the lower river braids just above the Rakaia Lagoon if approaching the mouth from the South Rakaia Huts. many anglers seem to prefer one side of the river mouth to the other rarely fishing the opposite side!